V Cafe is located on the corner of Carnarvon and Eighth St in New Westmister and serves a number of vegetarian options. 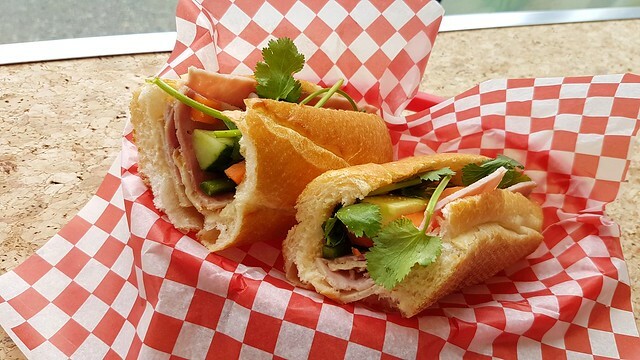 However, they also serve banh mi such as their V-Cafe Special Club Banh Mi ($6) which is supposed to come with Vietnamese ham, sausage, terrine, and liverwurst pate with crispy shallots, romaine lettuce, cucumber, cilantro, pickled carrots and daikon. I’ll start with the good… the crusty bun is exactly what you’d expect for a banh mi and it had a nice chew to the soft bread on the inside. Okay, that’s about it. The banh mi was rather basic and they seemed disorganized/slow when preparing it. They have one small toaster oven which they use to toast up the buns. There was a gentleman and a lady working on the day of my visit. The guy seemed to know what he was doing but I unfortunately had my banh mi prepared by the lady. Aside from the pickled veggies, cilantro, and ham, there was nothing else in the sandwich. And it’s not like she even bothered to ask what I wanted in it. I really missed the liverwurst pate the most because that’s my favourite part. 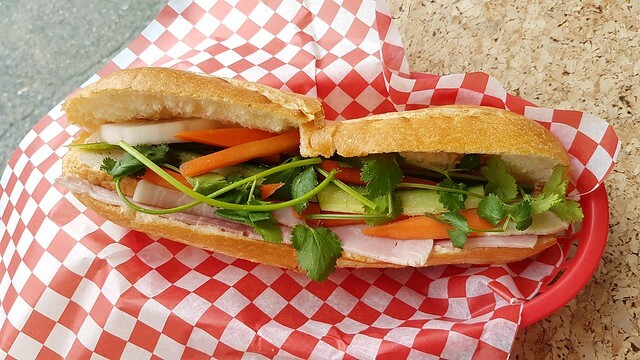 If you’re looking for a well-made banh mi, I’d suggest you walk over to nearby Banh Mi Bar instead. I decided to give them another chance and revisited to try their new Vegan Beef Curry with Baguette ($9.50). I don’t think it’s on their online menu right now but I saw it offered on their chalkboard when you walk inside (alternatively, you can order it with noodles instead of the baguette). 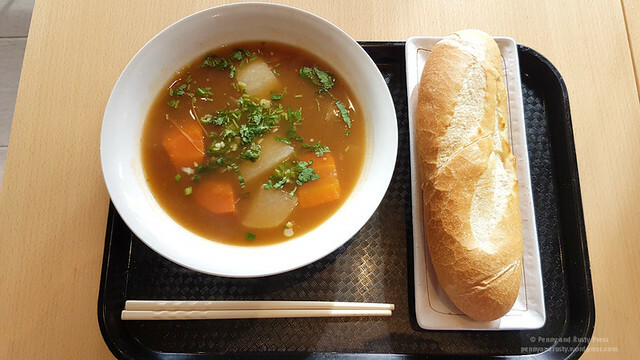 I wouldn’t really call this a stew as the broth is quite thin… it’s more like a soup which contains large chunks of carrots and daikon radish as well as some deep-fried tofu squares and vegan “beef” slices. The soup wasn’t bad and had a bit of flavour to it but it lacks the rich and bold flavours that you get with non-vegan stew. As for the “beef” slices, it’s typical of what you would expect for fake beef. The baguette had a good crust to it with a soft interior (same as what they use for their banh mi). 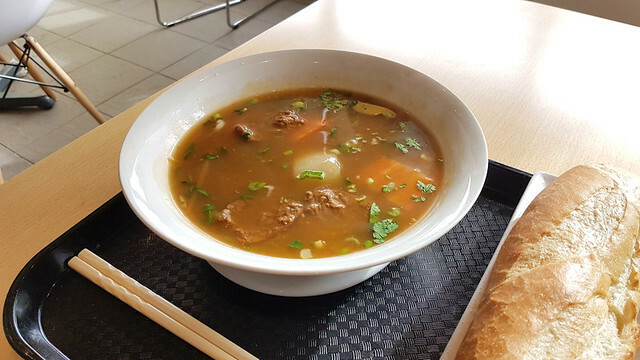 Posted on July 10, 2018, in Restaurant Review, Sandwiches, Vegetarian, Vietnamese and tagged Banh Mi, Food, New Westminster, restaurant review, Vegan, Vegan Beef Stew, Vietnamese. Bookmark the permalink. Leave a comment.